Members at the September meeting listen to the presentation by Thanan, HS1JAN of TAMSAT (standing) about ballooning and amateur radio, which is part of the "Amateur Radio is More than You Think" programme. The RAST committee is now gearing up for the upcoming intermediate class examination and training session that is scheduled for January 21, 2012 and has tentatively selected the venue: Bangkok University. While RAST is still waiting for formal notification from the National Broadcasting and Telecommunications Commission (NBTC), expected this month, working groups have also been set up to prepare for the exam and related training activities, with Vice President Kanchit Charmaraman, HS1JC, assigned to oversee this. Mayuree Chotikul, HS1YL presents IARU HF Championships awards for 2009 and 2010 in the phone category to Charly, HS0ZCW. The meeting on September 4, 2011, at Sena Place Hotel saw a good turnout and there was one first-time visitor and now a new Gold member, Christoph, OO7J, along with two returnees: Robert, G4YAV/HS0ZHA and HS1RVK. 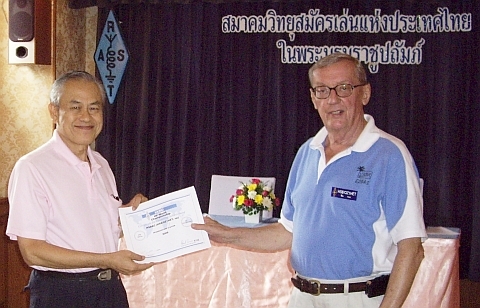 It was also announced that Thanawit Lerkruengpanya, the holder of the Thai novice class licence E20SNX, had obtained a full British amateur radio licence after passing the RAE exam there (along with the UK callsign M0SNX) and then, after returning to Thailand, he had been able to obtain a Thai intermediate class licence from the NBTC based on his UK licence -- thereby setting a precedent. Other Thai novice class licence holders who hold a full amateur radio licence of another country with a reciprocal agreement are now planning to apply for an upgrade to intermediate class. 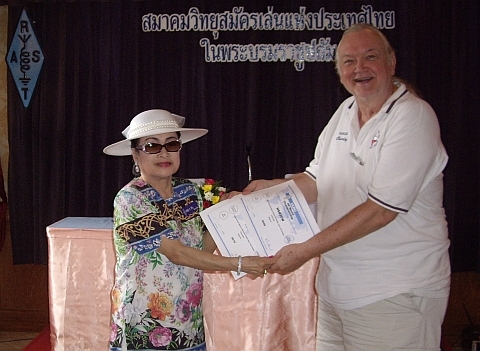 HS0AC Station Manager Finn, HS0/OZ1HET, receives an award as the HS0AC operator during the IARU HF Championships in 2009, when HS0AC was the HQ station for Thailand. Presenting the award is RAST President Chaiyong, HS1QVD. Finn, HS0/OZ1HET, provided a report of activity at the HS0AC club station at the Asian Institute of Technology, including activity in the Russian RDA CW contest (Aug 20-21) with 160 QSOs on two bands for 180,800 points and the Romanian DX Contest on the weekend of Aug 27-28 for 279 QSOs and 112,226 points. RAST President Chaiyong, HS1QVD, then invited Swen, HS0ZFZ, to explain a problem at the club station regarding its third, 30-metre tower for 15 metres, for which a thrust bearing and both coax as well as rotor control cable were needed. Swen asked for donations and after a bowl was passed around, those present contributed a total of 3,590 baht towards this. Thanks to all who helped out with this! Mention was also made during the meeting of 100 Watts Magazine's 25th anniversary which is to be celebrated on October 15 at the Thai CC Building off Sathorn Road, where the seminar "Ham Radio is More than You Think", led by Champ, E21EIC, will also be staged. RAST will reserve a table and anyone interested in attending should contact Khun Chaiyong, while tables may be booked directly through 100 Watts Magazine, with more details at their website. December 17, 2011 in Bangkok at Bangkok University (9 a.m. - 12 noon. Full details can be found at Champ's website E21EIC.net and preregistration is a requirement for those who intend to sit the exam. During the September meeting, Champ also brought along awards and announced the winners of the IARU HF World Championship results for 2009 and 2010 while RAST President Chaiyong, HS1QVD, and Chairwoman of RAST Advisors Mrs Mayuree Chotkikul, HS1YL, handed out the awards. Recipients included Finn, the operator of the HS0AC HQ station and a category winner for 2009, and Charly, HS0ZCW, the winner for Thailand and Zone 49 in both 2009 and 2010 in the single operator, phone category. Champ also won awards in both 2009 and 2010 for single operator, mixed mode operations while the other winners were E21YDP (CW, QRP in 2009), E21AOY for CW in 2009 and HS0ZEE (mixed, in 2010) and Champ said he would mail the awards to them. 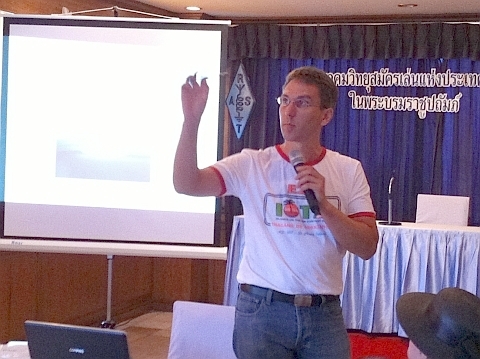 During lunch, a video of the A52A DXpedition to Bhutan in 2000 and made by James, 9V1YC, was screened, while following the announcements and awards there was a presentation about amateur radio and ballooning made by HS1JAN, Thanan, of TAMSAT. At the next meeting on October 2 there will be a video depicting the 2002 DXpedition to South Sandwich Islands to activate VP8THU. Our thanks to Charly, HS0ZCW for organising and arranging the videos. 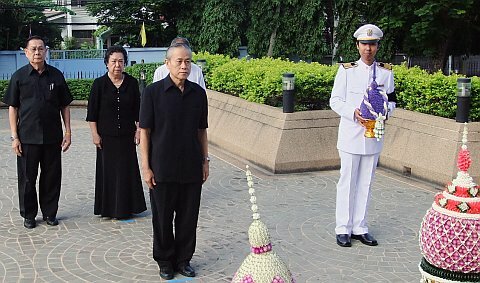 Early in the morning of Thursday, August 4 RAST President Chaiyong Wongwuticomjon, HS1QVD (above left), led a group of senior officers of RAST to pay tribute to King Chulalongkorn, King Rama V, who during his reign between 1868 and 1910 established the Ministry of Public Works to pioneer and oversee the development of communications in Thailand. 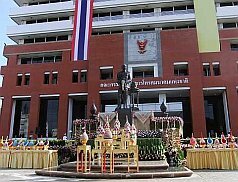 The ceremony, performed at a statue of King Rama V on the premises of the National Broadcasting and Telecommunications Commission, marked National Communications Day. With Chaiyong in the picture below are, from left, Maj Prasit, HS1DN, Yannee, HS1LCC and Narissara, HS1CHB (behind Khun Chaiyong), with a government official. 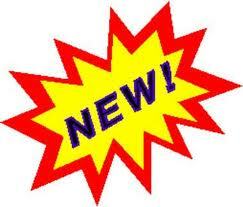 (Or click on the logo above... this opens in a new browser window). The August meeting of RAST on Sunday, August 7 featured a video of the DXpedition to Campbell Island (ZL9CI) made in 1999 by James, 9V1YC and this was followed by a presentation by Swen, HS0ZFZ about the RAST Forum web board. 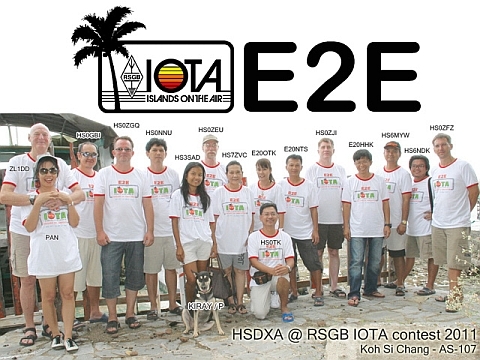 Swen also provided a report about the activity during the IOTA contest by a group of over 15 Thai and expat DXers and contesters who operated with the RAST club callsign E2E from Koh Si Chang on the weekend of Jul 30-31. This followed the buffet luncheon and social get-together with announcements of developments regarding amateur radio in Thailand made by RAST President Chaiyong, HS1QVD. Among upcoming events is the next VEC examination for a US amateur radio licence, led by Champ, E21EIC. This will be conducted in Chiang Mai on August 13, 2011 from 9 a.m. till noon. Anyone interested in taking this exam, please contact Champ in advance, and more information can be found here. It was also announced that the presentation during the September meeting would feature another video from James, 9V1YC about the A52A DXpedition to Bhutan in 2000 along with a presentation about how balloons can help with amateur radio communications from the TAMSAT group, led by HS1JAN. The Thailand-Denmark reciprocal agreement is almost finalised. This is according to the Danish National IT and Telecom Agency (ITST) who have informed RAST's HS0AC Club Station Manager Finn Jensen, OZ1HET, that Thailand and Denmark are close to a reciprocal amateur radio licence agreement. In a letter, they said that: "Thailand has approved the Danish draft, but with a minor correction, which we have accepted. We have informed the Thai authorities of this through the Danish Foreign Ministry and now we are just waiting for an acknowledgement from Thailand." "Concerning this, the Danish Embassy in Bangkok has confirmed to the Foreign Ministry that they have not yet received an answer from the local Thai authorities. This delay is probably due to the Thai election. The Danish embassy in Bangkok will of course follow up on this, but we have to be patient until a new government has been formed," the letter added. During the August meeting, Finn also informed members that during the IOTA contest on the weekend of July 30-31 a guest operator, Lars OZ1FJB, made 133 QSOs. Lars also donated 1,000 baht to the club station along with a gift-wrapped box which was opened at the meeting by RAST President Chaiyong to reveal a small "touch-key" engraved with Lars' name and callsign. 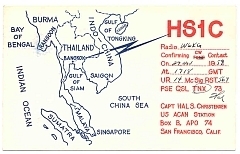 It is with sadness that we bring news of the demise of Hal Christensen, a US amateur radio operator active from Thailand in the late 50's who had held the callsign HS1C. Hal had also held the calls W4VC, W4RIM and K6RIM and had been an adviser at the Joint United States Military Advisory Group to Thailand (JUSMAG). Hal passed away on April 15, 2011, at the age of 88. Our thanks must go to Fred, K3ZO and HS0ZAR, for spotting this sad news in the September issue of QST Magazine and forwarding a QSL card for HS1C for a QSO Hal had with W6KG in 1958. 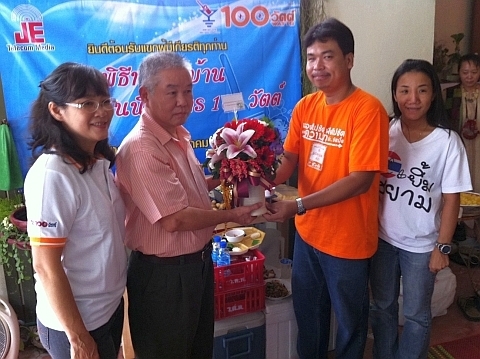 On August 9, 2011, Champ, E21EIC represented the Radio Amateur Society of Thailand by presenting a bouquet of flowers to the editor and the publisher of 100 Watts Magazine on the occasion of its 25th Anniversary. There will be a formal celebration on October 25 at the Thai CC Building on Sathorn Road, near St Louis Hospital, where tables can be booked for 4,500 baht and more information can be found at the 100 Watts magazine's web site (in Thai). The July meeting which took place on Thailand's national election day provided an update about the upcoming Intermediate Class examination, which RAST will supervise for the National Broadcasting and Telecommunications Commission and which will include a Morse code test as well. No date has been set for the exam yet, while the Morse code component poses the biggest challenge in accommodating the anticipated high numbers of examinees, expected to number over 500, who will pay the 400 baht application fee to sit the exam. The location of the exam has not been agreed upon yet while it is anticipated that the Morse code test will be administered in groups of 10. Final details will be worked out soon and will be announced later. In a related activity, Champ, E21EIC and a group of Volunteer Examiners will be organising the next VEC Examination for Thais or expatriate hams who would like to sit for a US FCC amateur radio licence in Maha Sarakham Province on July 16. The exam will take place at Maha Sarakham University from 13.30 to 16.30 that day and anyone wishing to take this exam should pre-register at Champ's website e21eic.net . There was no presentation at the July meeting while it was also announced that as part of RAST's plans to mark its 50th anniversary in November, 2014 special callsigns were being sought for HS50RAST as well as E2R, E2A, E2S and E2T while stations who work all four special callsigns will be eligible for an award. In addition, RAST is applying for the callsign HS84A to commemorate His Majesty the King's 84th birthday later this year and QSOs with this station will receive a special QSL card with HS1A's photograph and permission is also being sought for this. HS0AC Station Manager Finn, OZ1HET, reported that for June the club station had been active in the All Asia DX Contest where it had achieved its best ever score in that contest with 1,001 QSOs and 289,680 points in all. At its June meeting at Sena Place Hotel, RAST received a Toshiba laptop in a donation from Bernd, HS0ZIK, while new callsign badges were distributed free to the Gold members present in a gesture of gratitude for their support. Members were also updated on developments in the selection of National Broadcasting and Telecommunication's Commission (NBTC)'s officers, heard the results of the Voluntary Radio Association (VRA) election, were briefed on an outline of plans for the society's 50th anniversary in 2014 and heard a presentation about contesting from Charles Harpole, HS0ZCW (Charly). Charly's presentation had been the first in a series of activities that will take place regularly at monthly RAST meetings and will follow the routine announcements after lunch. The June meeting began with a minute's silence for RAST Life Member Kurt Klement, HS0ZIE, SM7WGP, who had passed away a few days earlier, succumbing to cancer in Mae Jo Hospital in Chiang Mai. 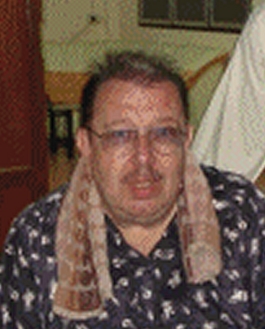 Kurt is survived by his wife of some 30 years whom he had met in Sweden and he had done much for amateur radio in the North of Thailand, including helping to introduce HF capabilities at the Lamphun Amateur Radio Society at Doi Khamor (HS5AL). The cremation had been on the same day as the June meeting and had been well attended, with many ham radio friends attending, according to Barry, ZL1DD, who had been present. RAST President Chaiyong Wongwuticomjon, HS1QVD, thanked Bernd for his generous donation of a Toshiba laptop and he asked HS0AC station manager Finn Jensen, OZ1HET, to take charge of the computer and add it to the list of assets at the station on the campus of the Asian Institute of Technology. Chaiyong also distributed complimentary badges made for Gold Members. RAST's Gold members are life members who make an additional 3,000 baht donation to support the society. In return their membership card is gold to signify this status, while now they have a callsign badge with gold text on a blue background, rather than white. Altogether over 20 badges had been made and they will be sent to members who were not present at the June meeting by post. Members also heard that RAST had transferred a second round of donations to the Japan Amateur Radio League (JARL) to assist in its efforts to help with communications following the emergency triggered by the magnitude 9 earthquake and subsequent tsunami on March 11, 2011. In May, RAST also responded to a questionnaire sent out to amateur radio societies asking about their membership, the equipment they possess and other details, while RAST also received a formal letter acknowledging a request to hold an Intermediate Class amateur radio training session and examination, dated May 20, saying that this was now under consideration. President Chaiyong also told members that there was one seat on the NBTC board of commissioners for a representative from a non-government organisation (NGO). 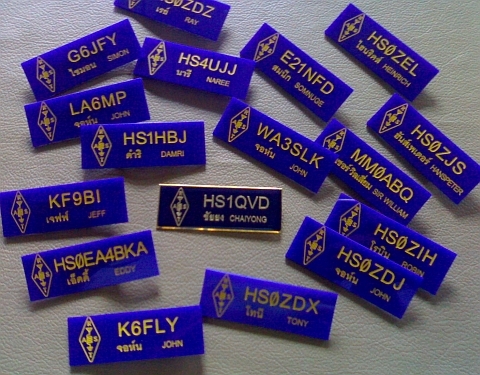 According to Kanchit, HS1JC, 80 societies, of which 40 were amateur radio clubs, had submitted a candidate. The selection committee will select just two applicants on June 10 and then a final selection for the position of commissioner would be up to the Senate. In the VRA election, Manas Songsaeng, HS1DE, has been reelected president, while there are 10 new faces on the committee and RAST vice president Kanchit, HS1JC, is now also a vice president of the VRA as well. The build-up to the 50th anniversary of RAST is beginning, even though the anniversary will not be reached until late in 2014, 50 years after RAST was incorporated as a society. RAST will soon offer polo T-shirts to mark the occasion, with Watcharapol, HS4DDQ, in charge of this, while permission to use special callsigns will be sought. These include HS50RAST as well as E2R, E2A, E2S and E2T, with the idea being to create a special award for any station that confirm QSOs with all four of these stations with these special three-letter callsigns. 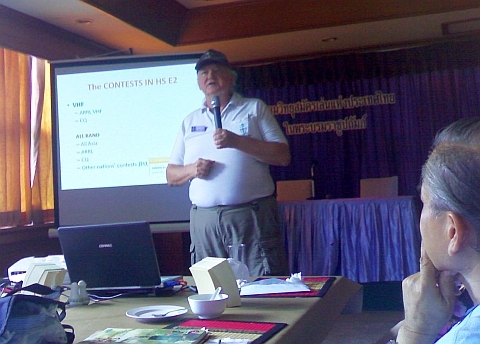 It was also announced that the next, RAST-spondored Volunteer Examiner (VE) examination for a US ARRL/VEC amateur radio licence will take place on June 11, 2011 at Bangkok University between 9 a.m. and 12 noon. Those intending to sit this examination may download a regisration form at e21eic.net , the website of Champ who is co-ordinating this series of examinations and need to notify him of their participation in advance. Providing a round up of HS0AC activity for May, Finn, OZ1HET, noted 400 QSOs in the Russian CQ-M contest on the weekend of May 14-15, 71 QSOs in the Spanish URE CW contest and 839 QSOs during the CW WPX CW contest (May 28-29). The WPX contest -- conducted under disturbed conditions -- earned a score of 579,726 points and Finn noted that it was nice to work E20WAX, E21YDP, HS5AC, HS0ZDY, HS0ZGV , HS0ZDR and HS0ZEE. Charly, HS0ZCW, makes his presentation. And, on the theme of contesting, Charly then gave a succinct 15-minute PowerPoint presentation where the theme was: "have fun, test your skills and make Thailand famous." He outlined the goals when contesting (winning, of course -- but also how to chose a category to earn an award) and looked at the key contests for Thailand, suggesting that the All Asia contest was "probably the best for us". He also reviewed equipment to use, suggesting: "use VOX or a foot switch to keep both hands free" and recommended logging software such as N1MM. He also addressed what antennas to use and how sometimes an antenna might be too high -- good for long-haul DX but not for contest work. He also advised taking rest breaks and offered tips, including using the same phonetics that other stations use when returning to their calls -- especially for stations in China or they won't know you have come back to them -- as well as the advantages of "hunt and pounce" and "run station" approaches, notably the importance of multipliers. The next RAST meeting is on Sunday July 3, national election day, beginning at 11 a.m. so there is time to vote, either before or after the gathering! It is with great sadness that we have to report that RAST Life Member Kurt Klement, 61, who holds the callsigns HS0ZIE and SM7WGP, passed away on June 3, 2011 after succumbing to cancer that had spread from his lungs to the rest of his abdomen. Kurt, originally from Sweden, had been living in Chiang Mai and he leaves a Thai wife. They had been together with for more than 30 years. Funeral rites are at Wat Wiwek Wanaram in Mae Jo, to the north of Chiang Mai, with Buddhist blessing ceremonies beginning in the evening on Friday, June 3, when they were sponsored by Niphon Sritrakul, HS0OAG. On Saturday, June 4 they take place at 8 p.m. with the sponsor being CQThailand.com, while the cremation will be on Sunday June 5 with rites beginning at 10 a.m. The cremation itself is scheduled to take place at 1 p.m. In addition to being a member of RAST, Kurt had also been a member of the Chiang Mai Amateur Radio Society and the Lamphun Amateur Radio Society and he had been very active in promoting the HS5AL club station at Doi Khamor in Lamphun province, just to the south of Chiang Mai. He had played a key role in getting HF capabilities installed there and RAST had helped Kurt in this mission by donating a transceiver and other equipment on behalf of the late Ed Rose, HS0ZAN, in November last year. May Kurt rest in peace.